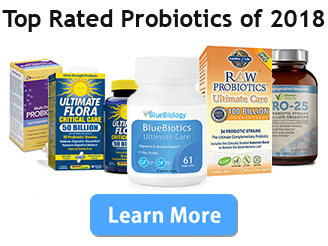 BlueBiology’s BlueBiotics Ultimate Care probiotic supplement has been our preferred probiotic supplement for some time now and it’s what we recommend the most when people ask us about probiotics. So when BlueBiology came out with their prebiotic supplement, we were pleased to get our hands on it for review. In this article, we report our findings. What does BlueBiology’s Prebiotic Contain? These prebiotics each have a unique role they play in digestion and general health. Chicory root powder is high in inulin content, which the authors of this study say “enhances the absorption of minerals and stimulates immune system”. They also noted inulin’s preventative role “against gastrointestinal complications like constipation”. In a randomized, double-blind, placebo-controlled study done on the effects of roasted chicory root extract, study authors concluded that chicory root improved bowel movement among 47 healthy adult participants. They also stated that their test results suggest that chicory root “could delay or prevent the early onset of diabetes”. In addition to lentils being a prebiotic and promoting/maintaining a healthy microbiota (the microorganisms that live in our digestive tracts), lentils have a number of other health benefits. Antioxidants are essential for the life of not just human beings, but all living organisms. Antioxidants promote health by protecting your body’s cells from free radical damage. However, additional evidence is needed on this subject. It’s important to note, however, that both of these studies called for more investigation into these topics, so more study is needed. Gum arabic, also known as acacia, is a dietary fiber that comes from the acacia tree. Gum arabic makes you feel full, so in addition to it being prebiotic, it can also potentially help you lose weight. Gum arabic is over 85% prebiotic fiber content by weight, making it the most potent prebiotic plant known. It’s also known to be bifidogenic, meaning researchers have established that it enhances the growth of the good probiotic bacteria bifidobacterium. (10) In at least one study, “numbers of Bifidobacteria, Lactobacilli and Bacteroides were significantly higher for gum arabic than for inulin”. (11) This is a relevant finding, because many prebiotic supplements contain only inulin, meaning they’re not providing the full prebiotic potential that you get with a supplement containing gum arabic and a good mixture of other prebiotics. Alpha-galactosidase is actually not a prebiotic, but there’s good reason for including it and you won’t find this in many other prebiotic supplements. Alpha-galactosidase is an enzyme that breaks down complex carbohydrates. What that means in a practical sense is that it will help in reducing the gas that you would likely otherwise have due to the fiber and carbohydrates. Not only that but it can also aid in digestion. Who is BlueBiology Prebiotics for? BlueBiology’s prebiotic is for men and women who want to improve their regularity and increase the amount of good bacteria (probiotics) in their digestive system. The recommended dose for this prebiotic is 1 scoop, which is 11 grams. The powder can be mixed with a drink of your choice. Should I take this with a probiotic? Absolutely! To get the most out of this prebiotic, it’s best taken with probiotics. This combination is referred to as synbiotics, as the two work together to improve the composition of the microbiota (the collection of microorganisms that inhabit the gut). (12) We recommend BlueBiology’s BlueBiotics Ultimate Care. Each of the ingredients in this supplement is known to be safe. Additionally, in our testing, we found that what was listed on the label was accurately reflected as ingredients in the bottle. Can I take BlueBiology’s prebiotic if I’m pregnant or nursing? We recommend asking your doctor about taking any supplement or medication if you’re pregnant or nursing. Does this supplement contain any allergens? This supplement is free of dairy, soy, and wheat. How should BlueBiology prebiotics be stored? This product can be stored anywhere that is room temperature or lower. They should be out of direct sunlight. 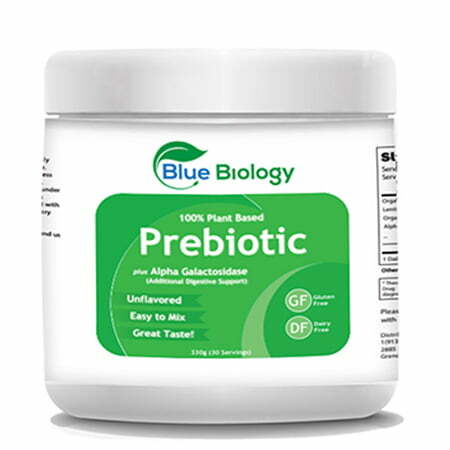 BlueBiology’s Prebiotic is an excellently formulated prebiotic that compliments their probiotic product very nicely. The prebiotic ingredients are high-quality and provide a food source for all types of probiotics. If you’re looking to improve your digestion, become more regular, and improve the health of your microbiome, this is the prebiotic supplement for you. You can find BlueBiology’s 100% Plant Based Prebiotic at BlueBiology.com.